July 28, 1984, LG Crabo. 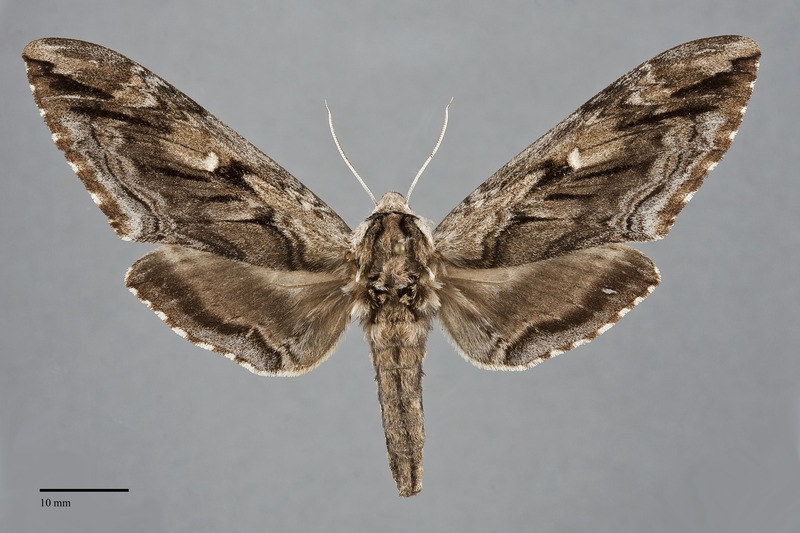 Ceratomia amyntor is a very large sphinx moth (FW length 44–48 mm; wing span 8.2–11.5 cm.) with mottled dark olive-brown wings and a white discal spot. It is an eastern species that has been found rarely in the Pacific Northwest. The forewing is elongate with a pointed apex and slightly concave trailing margin. It is mottled brown, variable from very dark brown to much lighter tan or yellowish brown but usually with an olive tint. The anterior third is lighter brown, and the posterior two-thirds of the terminal area is blue-gray. The dark gray and black lines are compound, very irregular. A series of irregular black dashes are present between the veins, extending from the mid-wing at the base of the median area to the apex. The fringe is checkered brown and white. The discal spot is white, lacking an outline. 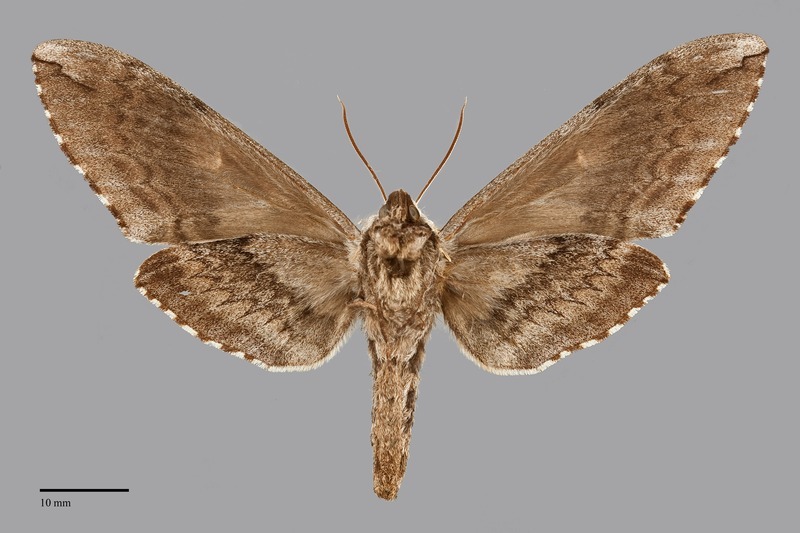 The smaller hindwings are more even dark brown with a paler base, blackish gray marginal band, and blue-gray at the base of the fringe. The hindwing fringe is checkered brown and white. The head and anterolateral tegulae are pale olive-tan, while the rest of the thorax is mottled dark brown and black. The abdomen is dark brown with longitudinal dorsal and lateral black lines. The antenna is pale, club-shaped. This species can be recognized by the mottled dark brown color, streaked dark pattern, and pale discal spot. It is most similar to Ceratomia undulosa but lacks the T-shaped marks at the margin formed by dark veins and fringe checkering in that species. Ceratomia amyntor should not be expected away from elms, its foodplant, which do not grow naturally in our area. The larvae can be variably colored as well and are best identified by two sets of prominent thoracic horns. Colors range from green to pinkish or various shades of brown. 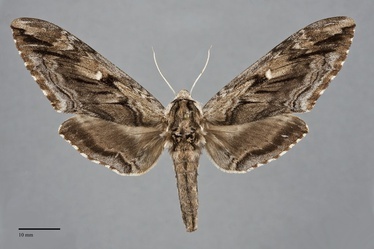 This species is native to hardwood forests in eastern North America, but extended its range westward across the Great Plains to the Rocky Mountains with the anthropogenic planting of elms for wind shelters on farms and in urban areas. The few records for the Pacific Northwest are probably accidental introductions from the East, and no permanently established populations are known at present except along the edge of the Rocky Mountains. Only a few reports of this species exist for the Pacific Northwest, mostly in western Oregon. It is unclear if these are random migrants or possible micro-populations occurring in local urban habitats. Populations are known in Park County, Wyoming at the edge of the Pacific Northwest region. Ceratomia amyntor is an eastern North American species. Its range extends west to the Rocky Mountains at the limit of hardwood forests on the Great Plains. The western limit of the continuous eastern populations extends from east Texas to southeastern Manitoba and western Wyoming. Its northern limit along the Atlantic Coast is southern Maine. This species feeds primarily on elms (Ulmus spp.) in the Ulmaceae, but is also reported feeding on basswood (Tilia spp.) in the Tiliaceae and birches (Betula spp.) in the Betulaceae. Larvae pupate in chambers several inches underground. In the northern part of its range, this species has a single generation with flight occurring midsummer. Further south two or more generations may be produced between March and October. The single record of this species encountered for this project is from late August. Adults are nocturnal and come to light. Adults probably feed on nectar although there are few substantiated accounts of them doing so.